PDF (Portable Document Format) files can be viewed with Adobe Reader. It is available to download for free at Adobe's website. You may print these catalogues for reference. These files are updated often. Updated information such as price will be first reflected on our online catalogues. You may download product summary for each article on their product page under the description. If you have any question that is not answered below, please feel free to contact us for information. Any part-cut or uncut article will be identified by its article number. /1 - Only part of the stone has been cut. /2 - Only the table of the stone has been cut. /3 - The stone has not been cut and has pressed facets. /4 - The stone has not been cut and has no facets. V - Effects applied on the reverse side. Z - Only part of the stone is treated for an effect. 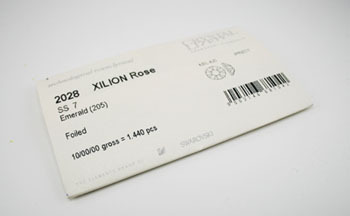 2X - Both sides of the stone are treated with an effect. These effecs are achieved by chemical or mechanical process. Platinum Foilng (F) - A silver mirror that is coated with a newly developed platinum colored, protective layer. Aluminum Foiling (M) - An aluminum mirror is applied using a vacuum coating process. 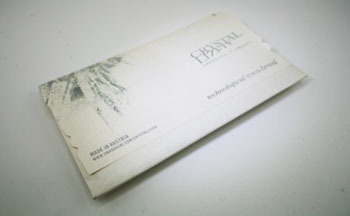 Unfoiled (U) - Usually an article not marked with any kind of foiling is unfoiled. Hotfix technology involves applying a specially developed glue onto the reverse side of Flat Backs. The glue, which is extremely flexible, is activated by temperatures between 120 and 170°C and bonds with the carrier material. The crystal element is permanently fixed onto the carrier material during the cooling off process. This variant of the Hotfix technology is a patented bonding agent that is applied to the reverse side of non-mirror finished Flat Backs resulting in an interesting “raindrop” effect during which the crystal takes on the color of the carrier materials. All Hotfix articles are also available as No Hotfix without glue applied onto the reverse side. Plating is an option available for most Swarovski settings that contain metal parts. All metal settings are made with brass. Settings without plating will appear in the golden brass colour. Streling silver base metal can be requested for additional charge. From left to right: unplated (raw brass), sterling silver plated, gun metal plated, gold plated. 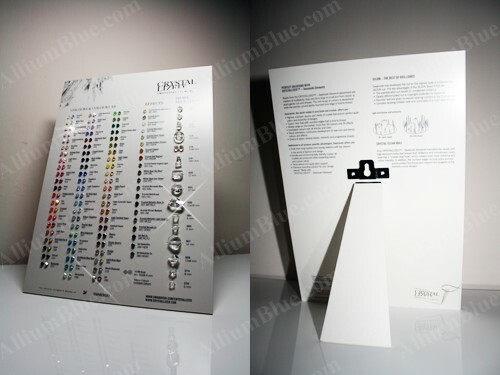 Limited Official Swarovski Colour Charts are now available for purchase, while quantity lasts.